This chapter outlines the clinical presentation and management of tumors that affect the lacrimal gland. Lacrimal gland tumors can be categorized as lymphoproliferative lesions, benign epithelial tumors, and malignant epithelial tumors. 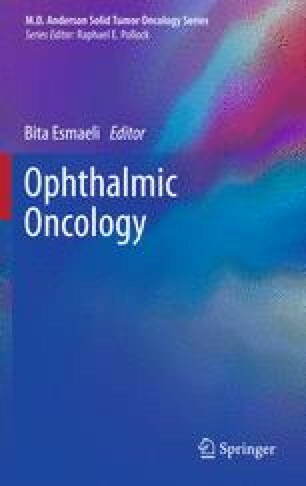 Lymphomas are the most common primary cancers of the orbit in adults, and the lacrimal gland is a frequent site of involvement. Benign epithelial tumors of the lacrimal gland include pleomorphic adenomas, oncocytomas, and spindle cell myoepitheliomas. Adenoid cystic carcinoma is the most common primary malignant epithelial tumor of the lacrimal gland; others include mixed tumor, adenocarcinoma, mucoepidermoid carcinoma, squamous cell carcinoma, oncocytoma, and acinic cell carcinoma. The American Joint Committee on Cancer staging system, which is used to classify many malignant epithelial tumors of the head and neck, can provide objective criteria for staging of lacrimal gland tumors. Because tumor stage at presentation may be associated with prognosis, it should be considered when treatment is planned.